Professor Aoki says, "ERK is known as a molecule that is closely related to cell proliferation, differentiation and tumorigenesis. This research was begun with the aim of visualizing the mechanisms of this activity. 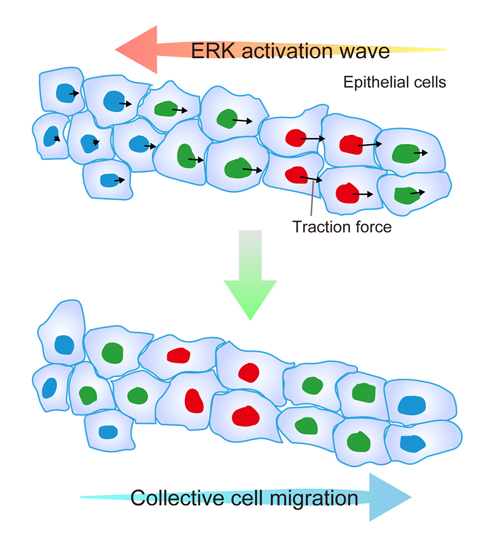 In the process of examining the change in ERK during wound healing we found that the activity of ERK is transmitted wave-like from the wound to the outside, and the responding cells moved in the opposite direction to the wave of ERK”. This result was published in "Developmental Cell".